This week has been a long one. For a while there I was afraid it wasn't going to end, but somehow I made it through and even managed to finish Exile along the way. Exile, to remind those who forgot and edify those who might be new, is the second book in a trilogy by R.A. Salvatore. (The first in the series being Homeland.) Exile picks up pretty much where Homeland leaves off, give or take a decade, which is pretty reasonable considering that the dark elf lead has the potential to live for centuries. Although given the protagonist Drizzt's current rates of dangerous encounters it might be a bit premature to call whether or not he'll make that that long. 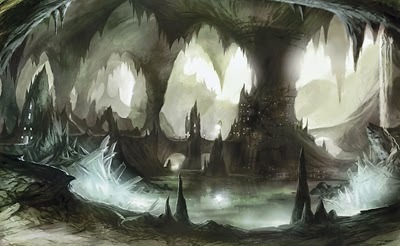 Despite the passage of over a decade, however, not much has really happened since Drizzt set out into the wilds of the massive underground cave system known as the Underdark (at the end of Homeland). Drizzt pretty much slums it on his own the whole time, slowly going mad from lack of social contact and the constant threats to his life in-between Homeland and Exile. When you start reading Exile Drizzt is just starting to consider the possibility that maybe his lack of social contact is starting to have some negative consequences. Considering that Drizzt's best friend is a silent magical panther from another dimension I'd be inclined to agree. Joking aside, Exile was difficult to get through at times, not because it wasn't good, but because I often wondered how I would do in similar situations. For most of the early parts of Exile Drizzt wanders about on his own fearing that he is losing himself and frequently giving into his more primal 'hunter' side. Although I wouldn't hold out much hope for myself over the span of a decade, I find myself wondering how I would do on my own given a more human time-scale. Say, one or two years for argument's sake, how would I do isolated from the rest of humanity? Would I be fine by myself for that long, assuming that I could procure food and shelter? For the virtue of a simple but thought-provoking situation I have to give Exile some credit. Perhaps I am overstepping my bounds a bit, but I'd argue that everyone wonders how they would fare alone at one time or another. That Exile capitalizes on that fact is to the author's credit. However, despite the day-dream-inspiring settings Exile is overall a weaker book than Homeland. It's kind of expected really, given that it's the second book. I know the second book, movie, season, whatever, always gets a lot of flack for not being as good as the first, but frequently that outcome is almost inevitable, even necessary. When you think about it, the follow-up, the second-in-whatever, is often a good concept, just not a great one. The second work is that idea that the author really wanted to use that didn't quite cut it as first premiere material. Maybe the second work isn't quite prime material but it's still better than a lot of other stuff out there. Especially in trilogies the second book is often under-appreciated because it is simply biding its time before the finale. That's where second books really shine though, they serve an important role as the lull in over-arching story, the break from the really big stuff. They are the quiet notes that make the next swell all the more impressive. That's precisely what Exile is. Exile lacks that wide cast of characters that Homeland had, as well as the complex web of plots and schemes. Gone too are the involved descriptions and observations of a foriegn society. Instead the second book takes advantage of the its position, assuming that the reader is now familiar with the basic concepts of the world, and performs well as the intermediary work. Exile is the work that connects Drizzt to his next great challenge, but even more so, delivers to readers more of what they want to see and know. Instead of a broader focus of an entire society, Exile showcases Drizzt's strengths and tests his limits. Story-wise Exile is much simpler and more straight-forward than Homeland, but its content is no less important. Knowing a character's limits grants you the perspective to know just how dangerous or innocuous future situations are. By establishing these character benchmarks R.A. Salvatore sets the context of Drizzt's later feats and accomplishments. Getting back to the story, Exile is much more action-centric this time around. While Drizzt does find his way into a few settlements and there is a moderate amount of downtime, there is still a lot more action connecting the scenes. Much of the action, of course, involves pinning Drizzt against deadly creatures and overwhelming hordes. Part of the appeal of the Dark Elf Trilogy for many is Drizzt's uncanny skill in combat. Throughout Exile Drizzt kills off droves of Underdark denizens, and is even partially responsible for the destruction of a Mind Flayer community. This is the same Drizzt who agonized over killing one of his own race, despite the fact that his opponent very clearly wanted him dead. Granted, Mind Flayers aren't the most pleasant of creatures, but the fact that Drizzt is partially responsible for the destruction of an entire colony is amusing. Drizzt even squares off against an old nemesis who will remain unnamed, but trust me it's showy and somewhat melodramatic. Thankfully Drizzt doesn't remain alone throughout the entire story either, because while he's an interesting character I still don't think he could pull off an entire story wandering around alone in the Underdark. which is visited in the latter half of Exile. Drizzt's first new and primary companion in Exile, (ha, literally in exile....sorry) is Belwar, a deep gnome. I won't give too much away but Belwar lost his hands in a battle and when Drizzt meets him, the gnome has a pick and a hammer in place of his hands. Belwar is a great character, I really like him, and his unique situation and portrayal as capable regardless of his disability is satisfying. However, I was a little disappointed that R.A. Salvatore never touched upon the challenges that Belwar faced. Despite the loss of his hands Belwar is never written as having particular difficulties. While it isn't pivotal to the story I don't see why R.A. Salvatore didn't at least touch upon it, especially given his attention to character and world details in Homeland. I will say this though, R.A. Salvatore took care never to forget that Belwar had a hammer and pick for hands. I forgot several times, to be honest, but was reminded at regular intervals when Salvatore included descriptive details, such as Belwar fumbling something into his pocket. Drizzt decides to leave the Underdark and journeys to the surface. One more thing I'd like to touch on before I wrap this up, is that the cover art on this and the previous book do not match up at all with the image of Drizzt I have in my head. I mentioned this before but given that my wife ranted at me the other day I felt maybe it was worth mentioning again. By the story's own admission, dark elves appear young except for the truly ancient ones. By ancient we're talking like eight-hundred plus years old. These are elves we're dealing with here. So while I'm not as adamant about it as my wife, I still disagree with the interpretation of Drizzt to the left. In fact, I don't really consider the cover to be a gracious interpretation of Drizzt at all. He kind of reminds me of a withered baboon there. Seriously, he just looks like a creeper. He's got a wild untamed mane of white hair and he's feeling himself up while casting a devious stare to his side. If you look closely at the full cover in the splash image (at the top of the page) you can see some, what I'm assuming are supposed to be deep gnomes or goblins, looking very alarmed. Just saying. So overall it was a good story but I'm looking forward to the next book. In regards to my writing I don't think I learned as much as I have with some of the previous books I've read, but I did get that second book revelation which I am happy about. Considering the number of books by R.A. Salvatore that I still have to go I'll have plenty of opportunities to compare and contrast. I feel I should mention at this point, however, that due to the interconnected nature of R.A. Salvatore's Forgotten Realms books I will probably be mentioning more spoilers in the future. I will, of course, try to keep the spoilers reasonable and to a minimum. If I'm trying not to spoil anything I'm afraid that my entries might be a bit dry especially as the series goes on, so there it is. Coming up next I will likely be covering either The Briar King or the final book in the Dark Elf trilogy, Sojourn, which is a New York Times Bestseller. Hmm, come to think of it all the authors I've read so far are New York Times Bestselling authors. Well, except for the unexpected Managing When No One Wants to Work, but shh, let's not talk about that. Until next time my readers! More to come soon.